In 1984, at the end of a two-year sojourn in the Greek village, Elika, I purchased an abandoned, deteriorating, roofless peasant house. Stone by stone, over the course of many years, I worked at restoring the structure without knowing what role the finished dwelling would play in my life. The book I went to Greece to write, Dancing Girl: Themes and Improvisations in a Greek Village Setting, was published before the house became habitable. 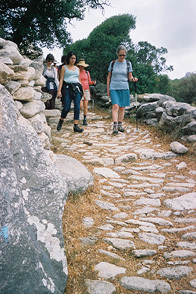 In 2009, twenty-five years after the fateful acquisition, I launched Astra Writing in Greece, a program for women writers who like to travel and to walk/hike. Because Astra Writing in Greece is limited to seven participants, you have unusually direct access to support for your writing from myself and other participants in the program. Because I know Greece intimately, our itinerary includes sites unknown to most tourists and inaccessible to larger groups. And because the villagers regard me as an Elikiotissa—a woman of Elika—they are sure to welcome you into their cafes and tavernas. My house in Elika will serve, of course, as program headquarters in Greece. We will gather there to write. Astra Writing in Greece is rooted in the understanding that the wellspring for good writing resides at the interface between experience and memory and in the awareness that travel, by generating experiences and evoking memories, replenishes the well. Our adventure takes place in the realm of the Muses and homeland of legendary writers, among them Homer, Sappho, and Kazantzakis. Like them, you will be inspired and transformed by the sun-drenched landscape and glittering seas, the rich cultural history, and a people renowned for their hospitality. Equipped with appropriate, sometimes spontaneously chosen prompts, you will engage daily in two or more hours of guided and independent writing. You will work on threshing floors, in ancient courtyards, on beaches, and on the terrace of a seaside chapel reached by a 90-minute walk along a coastal trail. Each day culminates with an informal meeting to reflect on your travel experience and to share the writing it generated. Our overriding goal is to provide a nurturing, non-judgmental writing environment that allows you to connect again—or perhaps for the first time—to your authentic voice. 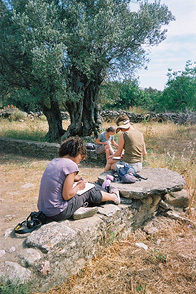 Astra Writing in Greece is an eleven-day program beginning and ending in Athens and featuring a six-day sojourn in Thordis Niela Simonsen’s village, Elika. The road we travel between Athens and Elika crosses the rugged mountainous interior of the Peloponnese; during our stay in Elika we reside by the sea. En route to the village, we overnight in Mystras, a fortified town settled by the Franks in the thirteenth-century on a steep side-spur of Mount Taiyetos. Our week in Elika is crowned by an overnight in a remarkable nearby fortified medieval town—the Mont-Saint-Michel of Greece and home of the renowned twentieth-century poet Yannis Ritsos. Our itinerary includes visits to select museums and historic sites, among them a tour of the Acropolis and the Benaki Museum in Athens and the Museum of the Olive and Greek Olive Oil in Sparta. Because walking and hiking are integral to the trip, participants must be comfortable walking/hiking rough paths in hilly terrain. Astra Writing in Greece is designed to ensure a balance between structure and spontaneity, between activity and serenity, between society and solitude. Note: Astra Writing in Greece offers pre- and/or post-trip extensions to broaden your travel experience. A lifetime in the arts—photography, painting, and writing—has prepared Thordis Niela Simonsen to nurture the callings of both aspiring and experienced writers. Extensive experience conducting small-group travel in Greece has prepared Thordis to guide your travels there; she speaks the language and knows the territory intimately. In 1982, Simonsen received a grant from the Ella Lyman Cabot Trust for documentary work in a Greek village because she expressed “bravery” and “venturesomeness” when she diverged from teaching biology to design and teach a course in cultural anthropology and to edit the oral history You May Plow Here: The Narrative of Sara Brooks (Norton, 1986). Her two-year sojourn in Elika culminated in the book Dancing Girl: Themes and Improvisations in a Greek Village Setting (Fundamental Note, 1991). In 2007, Thordis received a grant from the Kittredge Educational Fund for the completion of her third book, Dances in Two Worlds: A Writer-Artist’s Backstory (Fundamental Note, 2011). The book won the Colorado Book Award 2012 in creative nonfiction. At the age of 40, in 1984, Thordis purchased and subsequently single-handedly restored a roofless village house that had been used to stable sheep. Today, the house serves as home base for Astra Writing in Greece. Thordis lives alternately between Denver and Salida, Colorado. We reside in ideally situated small family-operated establishments throughout. We usually picnic midday: markets, bakeries, and produce stands are available for provisions. We order from the menu or from cooking pots in the kitchens of the restaurants where we enjoy our evening meals. Vegetarians are easily accommodated. The cost of the eleven-day Astra Writing in Greece program is $3125 (payable to astragreece inc.) plus uncovered meals ($250—$350) and airfare. Price is based on single occupancy except for Athens; a single-room in Athens is available for $60 per night. A non-refundable deposit of $500 is due on acceptance into the program. Emergency medical evacuation insurance is mandatory. A formal application is required. In three days, I learned more about writing than I did in four years of college and two of grad school as an English major at a leading university and 30 years as a professional writer/editor. I learned to relinquish my self-doubt and self-talk and trust the creative process. Wherever she’s going, just follow her and you’ll be fine. It’s right where we need to be.... I have more trust in myself—in my own ability to create meaningful writing—than I did before I came. All my expectations about Astra Writing in Greece (and they were high) were exceeded beyond imagination. I can't find words to express my gratitude. Everything about this trip was perfect: the travel, the hikes, the surprises, the restaurants, the writing. I felt immediately welcome, immediately embraced, and immediately safe within this group and totally confident in your leadership and planning. You were so thoughtful and attentive to everyone's needs, so incredibly accommodating, and, all in all, just a lovely spirit, a beautiful person. This trip exceeded my wildest expectations. I hope to be able to do this again next year. You have brought together a fabulous group of loving, talented women writers! It is your magic, your vision, and your charisma that does this! And this magic will not end. I completely intend to go again. It was an amazing experience, and I can't think of a better introduction to writing. Looking forward to next year's reunion. Seriously. To apply for Astra Writing in Greece, write your responses to the application questions in your prefered text editor, e.g., Microsoft Word, paste to the application pdf, and email completed form to program director Thordis Niela Simonsen at info@astragreece.com. If the pdf does not work, send the application information in an attachment or in the body of an email. Thank you for your interest in Astra Writing in Greece. Please do not book any flights until you have been notified that your reservation/deposit has been accepted. For additional information about Astra Writing in Greece, please contact astragreece inc. at info@astragreece.com or 303.321.5403. In addition, please refer to the Excursions and Sojourns section in this site, particularly “special features,” “accolades,” “reading list,” “considerations,” and “terms & conditions.” Most information applies to Astra Writing in Greece.